This July and August, several cooperative workers from Olympia are visiting CECOSESOLA, a huge network of cooperatives in Barquisimeto, Venezuela, marking the second exchange with our friends in the cooperative movement there. As many of you may know, recent months and years have seen Venezuela going through a grinding economic crisis, precipitated, in part, by the worldwide drop in oil prices. Growing political unrest has added to an already tense situation. 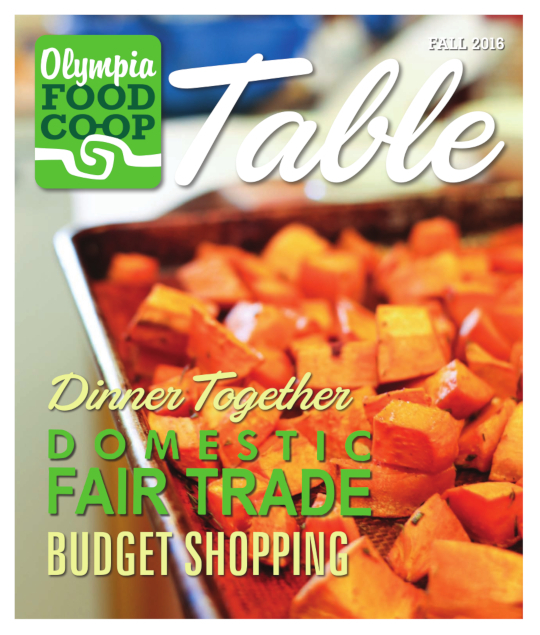 It has been both an honor and an eye-opening experience for representatives from the Olympia Food Co-op, The Northwest Construction Co-op, and the Flaming Eggplant Cafe to spend time with their fellow cooperative workers to the South during this especially trying time. Recently, I was able to catch up via email with Whitney Bard, your Olympia Food Co-op delegate on this exchange, and she shared some thoughts about the essential nature of the co-op economy during extremely difficult times. Increasingly, for many in Venezuela, sourcing basic staples such as food, medicines, and body care products has become difficult, and sometimes impossible. In her time in Barquisimeto so far, Bard has witnessed people waiting in line starting at 3 a.m. to buy basic subsistence items – many times only to have those items run out, or the stores fail to open, with fights sometimes breaking out among those waiting when they are unable to get in. A week ago, she says, a shipment of sugar arrived for the first time in two months to one of CECOSESOLA’s ferias (large, Costco sized cooperative food markets) and there was nearly a riot outside. In many areas of the city, buildings are crumbling for lack of access to building supplies, and infrastructure – such as garbage pickup – is being acutely affected by slashed budgets. And yet, despite the ex¬treme challenges throughout the economy, the difficulty in sourcing products, and the effects of scarcity showing even more strongly in the low-income communities CECOSESOLA serves, the co-op is still functioning, providing an essential, life sustaining service. As long as the farmers who are part of CECOSESOLA’s cooperative network can still buy seeds, fruits and vegetables, at least, will remain in strong supply. And so long as sup¬ply levels remain strong, the co-op is able to keep costs low enough that members of the local community (including co-op workers) can afford to buy food. CECOSESOLA is facing a strong potential challenge to their survival – recently the cash strapped government has moved to change a part of the cooperative law that exempts co-ops from certain types of income tax, be¬cause, unlike traditional businesses, they are required to share a similar amount of their profits with their local communities. If co-ops like CECOSESOLA lose their income tax exemption, the result will be extremely high tax rates, which could force them into bankruptcy. The co-op has therefore sent a team of workers to Caracas to lobby the government and lead demonstrations in the streets opposing this change. If the new law – dubbed doble tributación by CECOSESOLA and their supporters – goes into effect, the co-op will have to spend precious resources fighting it in court, not to mention the catastrophic effects it could have on them and other co-ops if it comes to pass.